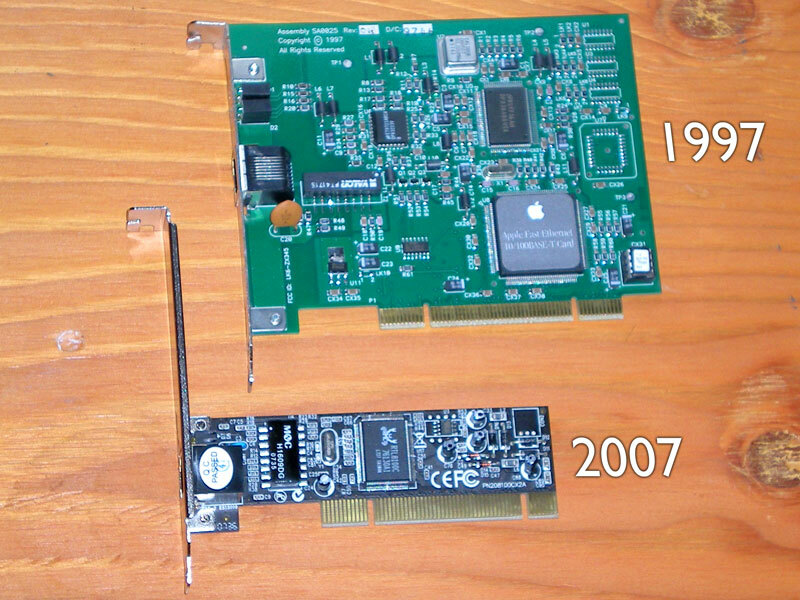 Top: Apple PCI 10/100 Ethernet Card. Manufactured in 1997. 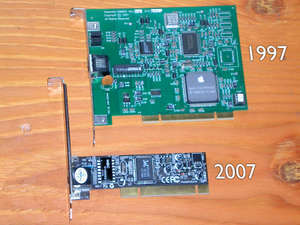 Bottom: Startech PCI 10/100 Ethernet Card. Manufactured in 2007. Non computer people are probably thinking "OMFG the new one is so much smaller" while at the same time, computer nerds are looking at this and probably thinking "10 years and thats the only size difference. I hope the new one also plays DVDs or somethin"
Actually there are cards that are the same size as the new one, and do much more, 10x faster networking for example (gigabit). And Apple makes a usb ethernet adapters that is a spec even compared to this card. In the end, the 2007 card simply can't be any smaller. The pins have to be where they are, the metal bracket has to be where it is, and they have to be connected with a piece of board strong enough that it won't snap off when you're trying to install it. But from a non-computer nerd point of view, it is cool how it's the exact same card, just way smaller. Oh and also, the 2007 card runs about $7. However the 1997 card, which is also an Apple card, probably went for $500 at least.